It’s here! Spring has (finally) arrived! It’s been unseasonably cold, then unseasonably warm, then chilly, then downright hot… and now we’re going in to Memorial Day Weekend at 60° – the farmers must be going crazy, and I hate to think how this is confusing the plants… But I got to Greenmarket this week (I didn’t, last week) and the Spring vegetables were in! I didn’t get a lot – Rich has a crazy schedule this week, so the asparagus and strawberries will wait (and, around here, they’ll just get better over the next few weeks… only a few stalls had them yet.) 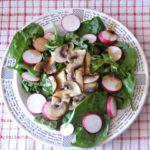 But I have salad greens – I’ve been wanting salad, the days it was 85°! Rich had yet another day of coming home very late to dinner. Usually I cook something that will hold over well, and reheat it when he gets in – but that didn’t feel right with the lovely fresh greens. 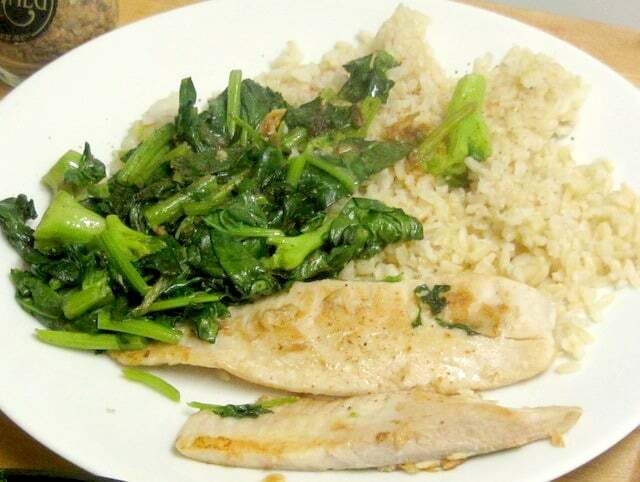 But spinach cooks in just a few minutes… and then I thought… I had some tilapia filets in the freezer. Instead of holding dinner for him, how about making one so easy and quick that I could cook something fresh for each of us, without it being a hassle? Well – I set up the rice cooker – I didn’t mind keeping rice warm… and I took the fish out of the freezer to thaw. 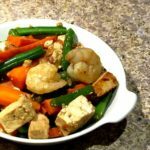 I’d actually put together a packet of four very thin filets – two each – which would cook even more quickly than if I had one larger one for both of us, as I more often would. And of course it thawed very quickly. When I was ready for dinner, I cut the spinach leaves into manageable pieces, and used a salad spinner to wash and dry enough for one serving. 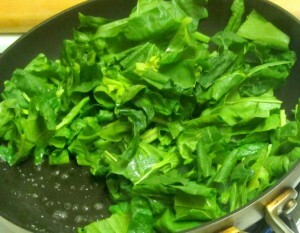 Usually I leave greens a little damp, so the steam will help cook them, but not spinach – it is too tender. 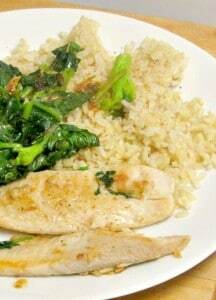 I decided to use butter for flavor, instead of oil, and melted just a little in the pan, then added the spinach. I stirred it around until is just started to soften, then pushed it all over to the side, melted a touch more butter, and added the fish. When I’m cooking meat – a chop, steak, other slice of meat – I usually brown both sides quickly on high heat, then lower the light, cook it until it is cooked more than halfway through, then turn again to finish it. Fish is more delicate, though, and can fall apart when cooked – so I left it on the first side about two minutes, then turned it, and cooked it the rest of the way without disturbing it. I would give a thicker filet more than two minutes, but the principle is the same – I want to turn it while the center is still raw, so it will hold together. Anyhow, I turned it as soon as the first side was done, stirred the spinach around some more. Fish and spinach were done about the same time (Don’t count on that – a larger filet will take longer, or you might prefer the spinach cooked more or less than I do. There won’t be more than a few minutes difference, though.) 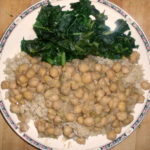 I removed each from the pan as ready, and put it on a plate with the cooked rice. Then I deglazed the pan. That sounds fancy, but really it’s very simple. There was a little browned butter and juices from the fish and the spinach stuck on the bottom of the pan, and I don’t want to waste flavor… so I poured in just a tiny splash – maybe a teaspoon for the one serving – of champagne vinegar. 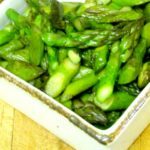 I chose that because it’s a little milder than the other wine vinegar I have on hand – I did think of using rice vinegar, which is still milder. (Or you can use a little wine, if you have it on hand, or just broth or even water, though I prefer the acid of the vinegar.) I just let it boil and stirred it around, scraping the pan, so all the goodness came up into the liquid, and then poured it over the fish and rice. The vinegar smells very strong when boiling – it may seem too strong, then – but I really didn’t taste the acidity at all… just a bit of a perk of flavor. And a friend had just been talking about nutmeg, which reminded me – it’s lovely in spinach, and works nicely on a mild white fish, and I tend to forget all about it… You can get it ground, and you can get whole nutmegs and a grater – but I have this nifty jar of broken pieces that lets me grind it fresh with a bit less fuss… and the fresh ground has so much more flavor than anything that’s been sitting around already ground. I really used just a little, a few grinds, rather like pepper. So there it was, and it was lovely, and I ate and enjoyed it all. Then I washed more spinach, to be ready. When Rich finally got home at 10, I put the pan on the stove, and his dinner was ready in the time it took him to put his things away and wash up… nice and fresh, not warmed over. And that is worth something. Chop spinach coarsely, and remove root ends and, if desired, stems. (These were tender enough to keep.) Wash carefully to remove sand, then dry. 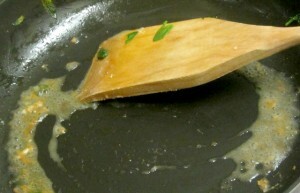 Melt a little butter in a pan, Add the spinach, and stir lightly until is starts to soften and shrink a little. Push it to the side. Add more butter if needed. Place the filets in the pan. Cook about 2-3 minutes, until the outside facing the pan is cooked but the center is still uncooked, turn over. Cook another 3-6 minutes, or as needed to cook through - be careful not to overcook. 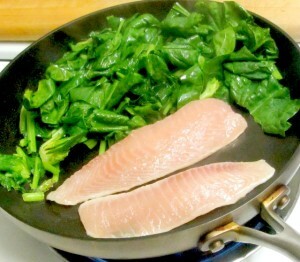 While fish is cooking, stir spinach occasionally. Remove from pan when done to taste. Remove fish when done. Add vinegar to pan and deglaze. Pour over fish. 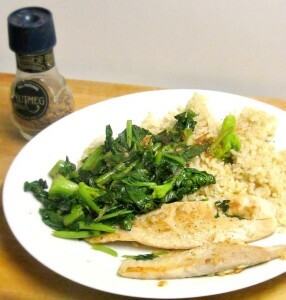 Grate nutmeg over fish and spinach. This is a single serving - it can be increased, or can be made one serving at a time if people are not eating at the same time.